With the Double Hot & Trendy Beads of the Month™ Club, each month you will receive 8 tubes of different popular beads. If you've seen it featured in your favorite bead magazine, you'll find it in this Club! 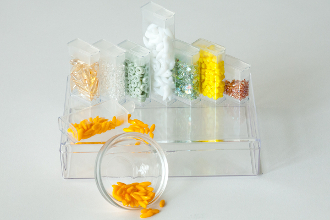 Each color coordinated collection will have a variety of the beads shown in the picture (weights and counts vary per bead type) as well as other beads as new shapes and finishes become available.You will receive the same types of beads as in the Single Club, only twice as many of each type. When you order a Double Collection you gain additional savings! With your Double Hot & Trendy Beads of the Month™ Club you will also receive a code every month that provides you access to our FREE pattern page! Codes are valid until the last day of each month, then new codes are sent out with the next shipment for the next month's FREE patterns.